If you’re building a deck from cedar or pressure treated lumber, you’re not alone. Traditional wooden decks are a backyard staple. And you’ve seen wooden decks where the tops of the posts begin to crack and rot when left exposed to the elements. Wooden post caps are a great way to protect the ends of your posts while adding a polished look to your deck. Available in many styles and multiple hardwoods, softwoods, and treated options, wooden post caps maintain the integrity of your posts and lengthen the life of your deck. Wooden post caps are usually glued and stapled together from mitered trim pieces. Premium options routed from a solid piece of wood, like these from Acorn Deck Products, offer the most protection possible. Whichever style you choose, you can keep the ends of your posts looking great without giving up the classic look of wood. 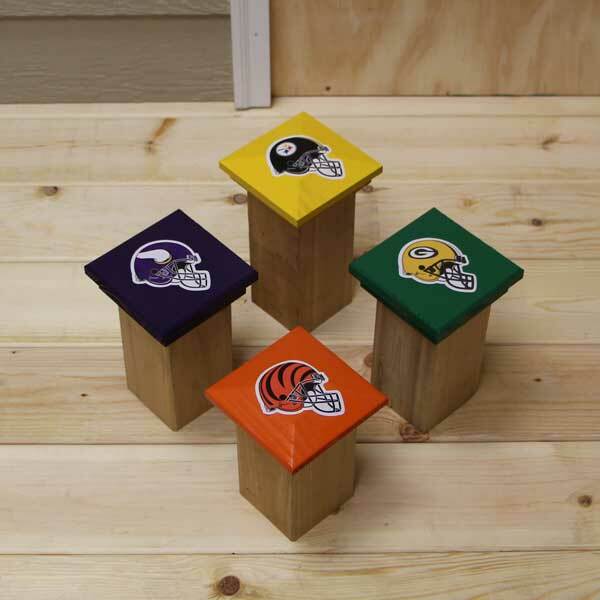 Whether you’re into football, baseball, or another sport, custom painting a set of wooden post caps can be a great way to add your team’s colors to a backyard BBQ. Because post caps are easily installed with just a few dabs of silicone, it is possible to change your post caps for any special occasion - including your fantasy football draft or the kids' graduation party.